Kayin Barclay has had a banner year. 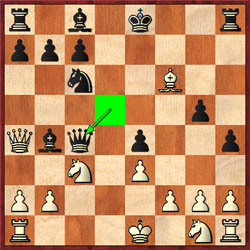 He eclipsed the 2000 rating barrier and qualified for the Denker Tournament of Champions for the second year in a row. 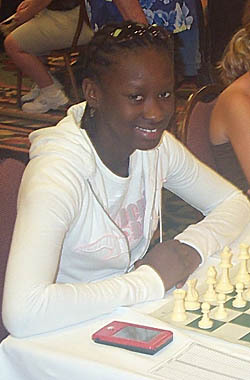 Jessica Wamala has also proved that good things come in pairs as she qualified for the Polgar Invitational the second year in a row. Speaking of pairs, scholastic standout Jacob Wamala is the older brother of Jessica. He played Barclay in a "Friendship Match" and the two have indeed become friends. Kayin Barclay played in the Denker tournament for the 2nd consecutive year. He scored 3½-2½ and tied for 10th. There were 46 players. Barclay scored a solid 6-3 at the U.S. Open. The Wamala chess clan was in full force at the U.S. Open with father, Severine and younger brother, Yowana rounding out the Wamala quartet. While Jessica was playing in the Polgar Invitational, Jacob narrowly missed the right to compete in the Denker. After placing joint first with Josh Bakker in the Massachusetts Denker tournament, the officials decided that Wamala (despite better tiebreaks) and co-champion Bakker would play a blitz match to determine who would go to the Denker tournament. Bakker won and the Wamala duo will have to wait another year to compete as a brother-sister team in the Denker-Polgar tournaments. Jessica scored a solid 4-2 score which was good enough for joint 6th. Last year she played in the Polgar tournament and scored 3-3, but won the Class "C" prize at the U.S. Open with 5-4. This time her fortunes were reversed as she mustered only 3½-5½ in the Open tournament, but seemed to be enjoying herself immensely. The affable 15-year old was an imposing figure as she plays basketball at Lowell High School. Hopefully chess will remain as a nice compliment to her inevitable success on the court. 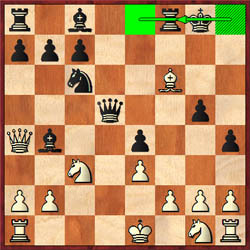 Jessica showed a nice display of positional understanding and tactics in her game against Dana Hannibal of Oregon. The game was decided early, but the way Jessica secured her advantage was through simple and logical opening play. After black panicked, her king got stuck in the center and eventually she had to part with massive material. However, she also showed that she needed better theoretical preparation as she lost quickly to Texas' Anjali Datta on the white side of a Benko Gambit. Both Kayin Barclay and Jessica Wamala represent bright scholastic stars and this is particularly important within the Black community. 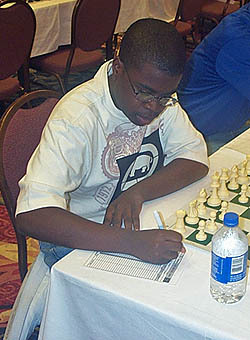 With other stars on the horizon (such as Tapiwa Gwaze, Jimmy Canty, Darrian Robinson and Briana Conley), their presence in the Denker and Polgar tournaments will inspire many to seek the highest honor in scholastic circles.